a highlight of the rooms has to be the designer bathrooms with huge standalone baths which also open out onto their own totally private outside showers which we always find to be a big favourite amongst guests! Strictly speaking Black Rhino Game Lodge is not actually in the Pilanesberg National Park at all – it actually lies within a small private reserve which abuts onto the north-western section of the main park, but given that there are no fences in place to all intents and purposes it is part of the main Pilanesberg reserve. It does however have some significant advantages in that no public traffic is allowed in this section so you enjoy a far more exclusive and genuine experience than driving through the southern section of the park along with throngs of tourists in their private vehicles. 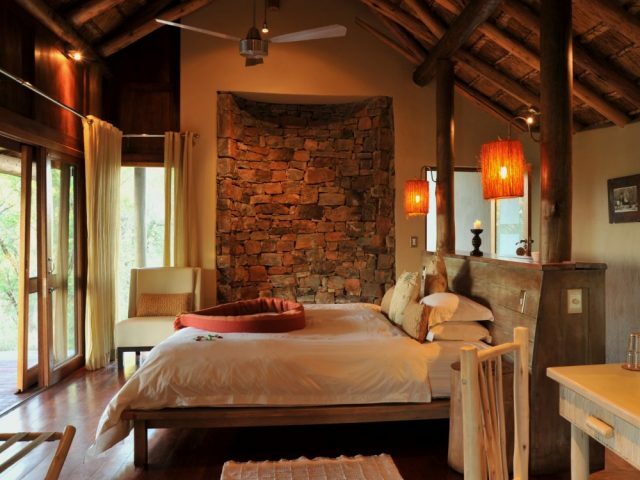 The lodge is a hidden treasure set amongst the trees of an old tamboti forest within the Black Rhino Private Game Reserve and overlooks a busy waterhole which is a hive of bird and animal activity, especially elephant! The lodge boasts 18 suites (including 4 family units) which are all free-standing and very spacious and luxuriously appointed to ensure that you can go wild in style. The lodge is actually divided into 2 sections with 14 suites at the main lodge (12 twins and 2 doubles) whilst there is also a satellite camp about 700 metres away which consists of the 4 Family Suites and which also offers its own pool and central lounge area – this way the lodge is usually able to separate the families with kids from the couples who will no doubt appreciate the extra peace and quiet that results! 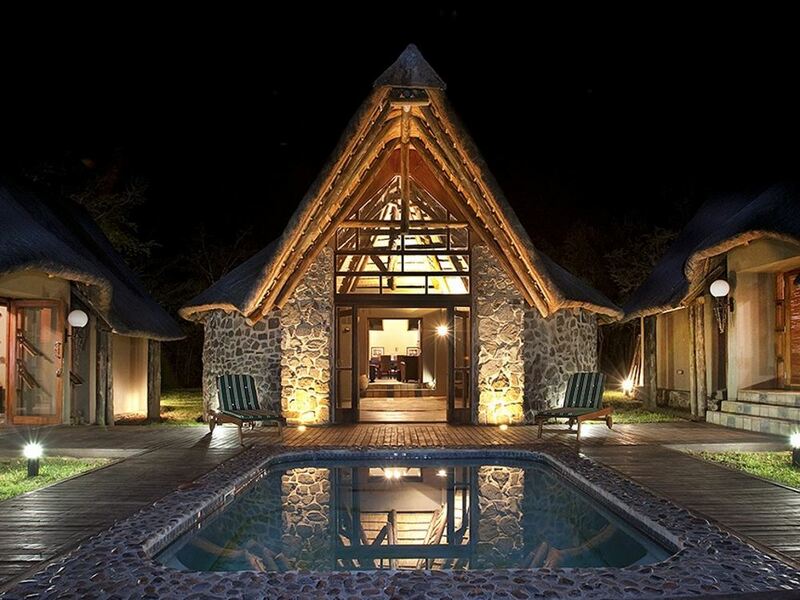 The comfortable suites are quite elegant and minimalist with lovely thatched roofs sporting exposed timber beams. They’re also nice and spacious with a lounge area and to ward off the summer heat that’s usual in the Pilanesberg, the suites come equipped with an air conditioner - you also have a private deck that opens out into the bush. A highlight of the rooms has to be the designer bathrooms with huge standalone baths which also open out onto their own totally private outside showers (except for the 2 double suites oddly) which we always find to be a big favourite amongst guests! In terms of the main lodge public area, there’s a small central entertainment area comprising of a boma area where guests enjoy meals under the stars around a blazing bonfire and the lounge is a great place to relax or meet fellow guests. Both the bar and the atmospheric restaurant open out onto the viewing deck, where you may also enjoy a meal overlooking the watering hole where you can watch animals coming through to slake their thirst. In the heat of the summers you can enjoy the cool plunge pool or simply relax with a drink and listen to the sounds of African bush! As far as the game is concerned, the Pilanesberg has developed into one of the most exciting parks in South Africa – incorporating an ancient volcanic crater of some 1200 million-years old, with the Mankwe Lake in the centre, the circular bowl was recognised back in the 70’s as being the perfect situation for a national park with its tall sides creating natural boundaries and its ideal location being relatively close by to the major cities and of course, being basically around the corner from Sun City. Operation Genesis was launched in 1979 to rehabilitate the land (which had been used for farming) and re-stock it with game. The Black Rhino reserve's lower lying sweet veld vegetation complements the Pilanesberg's predominantly mixed sour veld which is positioned between the Kalahari and Lowveld - this mix of habitats results in a wide variety of game species and sightings of the Big Five are very common, as well as rarer species such as Roan, Tsessebe and Sable antelope. 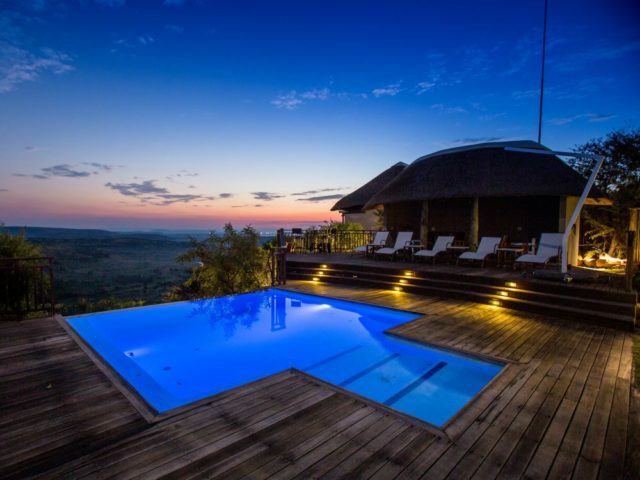 The landscape too is an alluring combination of rolling hills, tumbled mountains, graceful valleys, grassland plains covered with pristine bushveld and tamboti forests. 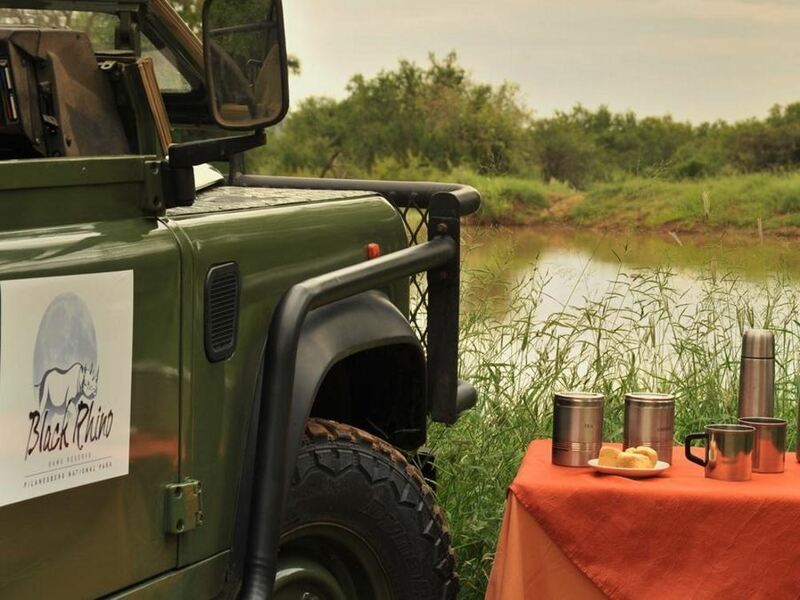 Once you are awakened with a hot cup of coffee, your host game ranger will take you out on your morning game drive in open 4x4 vehicles, taking you through Black Rhino Reserve and further into the Pilanesberg reserve as a traversing agreement exists with the main park - the best part of this reserve is that, unlike the Pilanesberg, it's private and no vehicles except for those of the resident lodges are allowed to drive within this reserve so you don't have to share this beauty with the public! Each drive will be different and a new experience with amazing sightings of a variety of predators, herds of elephant, black and white rhino, antelope and much, much more – all often seen at close range as they are not generally skittish. And of course with Sun City just 30 kilometres away, if you fancy enjoying a round of golf or some of the resort’s other facilities then Black Rhino is a convenient way of giving you the best of both worlds! A conservation levy of R121 per person per day, Children from 4 – 11 years pay R71 per child per day - subject to change. Children aged 0 - 5 years will stay free of charge when sharing with two full paying adults, maximum of 2 children sharing with 2 adults. Children aged 12yrs & older will be considered adults & accommodated in their own rooms. Children 0 - 5 years are not permitted on game drive.